https://houston.bintheredumpthatusa.com/dumpster-rental-sugar-land	Bin There Dump That Houston	https://houston.bintheredumpthatusa.com/img/franchisees/54.png	20730 Highland Hollow Lane,, Humble, TX	Contact us for more details. Discover how we make renting a dumpster in Sugar Land, TX a simple and easy process. Bin There Dump That is committed to making the dumpster rental process for the customer a seamless transaction, from placing an order for the needed dumpster size to delivery of the waste container in Sugar Land to an immediate pick up when you no longer need the bin on your driveway. Is there a specific place to put my rental dumpster? Appropriately named due to its history as a sugar plantation, Sugar Land is now one of the fastest growing Houston suburbs. It’s also one of the most affluent Houston suburbs with lots of job opportunities. 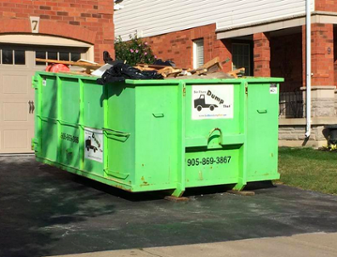 If you’re renovating your home in Sugar Land, don’t settle for anything less than the best dumpster rental company in town. Some dumpster rental services don’t care about your property. That’s why we always lay down boards to protect your driveway from any scuffs. And we make residential dumpster rental even easier by taking your haul to the dump for you. Step back in time to the pioneer days. George Ranch is an immersive experience with costumed actors living just like Sugar Land settlers once did. Watch as the blacksmiths use primitive techniques to create beautiful ironwork. Then watch the cowboys lasso in the cattle for the evening. On Saturdays, the Ranch offers lunch based off the recipes of the original settlers. Oyster Creek Park takes you up a 3-mile hike to see the beautiful rock-lined waterfalls and a natural amphitheater. Just off highway 6, the park is super easy to get to and makes for a perfect weekend getaway. Usually, Memorials have a somber note to them. Not the Sugar Land Memorial Park. With over 2.5 miles of walking trails around the pristine lake, you won’t want to leave this memorial. There’s an enclosed area to let your dogs run free while your kids play with the pond’s water sprayer feature. And don’t worry, there are outdoor showers so everyone can get cleaned up before packing up for the day. Your local Dumpster Rental Sugar Land dumpster rental operators are Ivan & Michelle And Tony & Sylvia.